Like pretty much every online lender SoFi's growth has slowed but they are positioned better than most. Last month SoFi quietly crossed $10 billion in total loans issued. A remarkable achievement for a company that is less than five years old. For comparison, Lending Club took almost eight years to get to that milestone and Prosper has still not reached it. Now, to be fair SoFi has not built their business on unsecured consumer loans, although they do offer that product. SoFi’s initial loan product has been refinanced student loans, which have a much larger average loan size. They invented this product and it still remains core to their business. But they have since expanded into personal loans and real estate mortgages, including jumbo mortgages, which obviously also have a large average loan size. 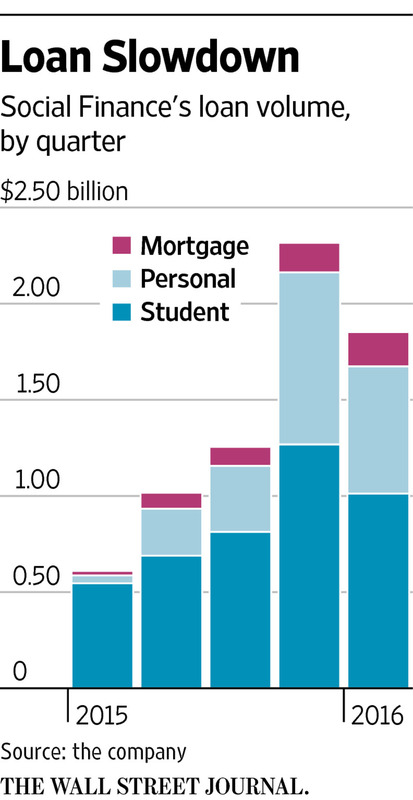 While SoFi does not provide publicly a breakdown of their volume by loan type there was this graphic in a Wall Street Journal article featuring the company earlier this week. This doesn’t have Q2 numbers but we can see that student loans is roughly 50% of their business, unsecured personal loans is 40% and real estate around 10%. In SoFi’s latest fact sheet, that is available on their press page (it is current as of this month), we see that SoFi has originated $3.5 billion in the first six months of this year. The Wall Street Journal stated that SoFi did $1.85 billion in Q1, which means it did $1.65 billion in Q2. While these numbers reflect a downward trend from the roughly $2.3 billion they did in Q4 last year this trend is far less than most other marketplace lending platforms. I have been in China this week for the LendIt China tour and I have listened to Mike Cagney, the CEO of SoFi, speak on two different occasions here. Both times he spoke he said that SoFi is now doing “around a billion dollars a month” in originations. Given that they did well under a $2 billion in Q2 this means they must be having a very solid start to Q3. It would also mean that SoFi is now the largest marketplace lender in the US given that the previous #1, Lending Club, has declined sharply in recent months. I should point out that SoFi doesn’t run a true marketplace and they rely on securitizations as their primary funding source. Of the roughly $10 billion in loans issued $3.8 billion were funded through a securitization. They have also done $3.1 billion in loan sales to banks and other institutional investors. Mike Cagney recently announced that they are looking to start their own hedge fund to reach more investors. When it comes to their consumer loans, in particular their student loans, I would challenge anyone to find a better loan book anywhere on the planet. The numbers are staggering – they are not in the fact sheet but came from the presentation Mike gave in Beijing. Of the more than 100,000 student loans that SoFi has issued in the past 4+ years they have had a grand total of 17 defaults. That is less than 2 basis points (or 0.02%). It is no wonder that both Moody’s and DBRS gave SoFi’s last securitization a AAA rating – another first for the industry. There are a few other things that SoFi have done that set them apart from every other company in the industry. They have an in-house recruiting team whose sole purpose is to find SoFi members a new job should they happen to find themselves out of work. So, far this team has successfully placed over 225 members in new jobs. They also provide new entrepreneurs with a six-month loan deferral to help their business get started and more than 50 members have taken advantage of that. Not only that but they will help these entrepreneurs raise capital from their fellow SoFi members. Another thing they have recently started, which sounds completely crazy I know, is a dating service for its members. They have had several live events and according to the company these events have been oversubscribed. Mike Cagney has even offered to pay for the first wedding between SoFi members. This is certainly a different route to take for a financial services company. SoFi is a modern finance company taking an unprecedented approach to lending and wealth management. Clearly they are making wealth management a cornerstone of their business going forward. If they can pull that off successfully they will be in a class by themselves, at least in this country. In China many marketplace lending platforms offer wealth management services. While rapid growth in this industry is not the norm any more there is no denying SoFi’s progress. They have not had the large declines that have happened at other platforms and it sounds like they are already back on a growth trajectory again.